Disclaimer: This is an independent piece and has nothing to do with the official weekly TL Proleague recap. Everything in this recap relevant to players performing well or badly is referring exclusively to their expectations in FPL. Those who were hyping Dark as the next breakout player for SKT were not disappointed. Although he lost to Cure in this scheduled match, as his macro play was slightly outdone by the Jin Air Terran, Dark displayed a higher level than many expected in the ace match against Maru, as he played a currently favored aggressive ZvT style to eventually overwhelm his opponent with a vastly superior economy. Looking forward, Dark should become a solid player on his team's roster and shouldn't be traded off many FPL teams. His play was surely inspiring for those who decided he was worth putting faith in. Bbyong performed much better than expected, as his 2 rax strategy performed unusually well against Life's pool first and he eventually cleaned up with hellbats followed up by a mech push. As many people were desiring a Bbyongjwa win, this event was well-recieved for many that were faithful in their FPL picks. Ouch. YongHwa was not supposed to do anything this week. In fact, 16% of the people that had YongHwa in their FPL team traded him off after week 1, a higher percentage than every player except those who performed way below expectations and Hush. Their result was getting 1 point before YongHwa had even shown any games, as his team was 3-0'd before he got to play. An unusual number of people gave up on him very quickly after he did not get the chance to possibly beat soO. And yet, he scored five points, which made him hated by quite a few people that expected him to do nothing this week when considering their master plan for trading as efficiently as possible. Who was he traded for? sKyHigh, who did not get to play San. Oh, the irony. Hurricane, who was practically a lock to beat TANGTANG in retrospect, but not even that trade was worth it despite being perfectly reasonable. Four people also switched him out for Curious of all players, and although he put on a very intelligent yet idiotic game against herO[jOin], he was never a favorite in his match anyway. His loss probably stung the most for those four. Admittedly, nobody expected Choya to send out YongHwa of all people, especially when MarineKing had just won a very solid game against Stats and KT was a heavy favorite to field Zest in the ace match. But YongHwa proved that he was more than ready for the task as he executed a clever proxy gateway strategy to take out the GSL winner. This is why you don't quickly trade out a player after he doesn't even get to play, guys. Bbyong, you were supposed to lose to Life. Although nobody actually bought Life after looking at the lineups, 6 people out of over 800 decided he was less likely to beat Bbyong than Zest was to beat Panic, a decision which is, in retrospect, perfectly reasonable. Meanwhile, two brave souls who, for some reason, I can't find, bravely traded Dear away to potentially win points with Bbyong. Meanwhile, the CJ player's stock rapidly fell out of anticipation of the Blizzcon champion racking up another easy ZvT win, with about 1/7 of his supporters disappearing. Yes, he's simultaneously the second most valuable player and the second most costly player. As he was completely unpredictable in this match, numerous team captains quickly regretted taking him off while so many others felt secure about their faith in the CJ Terran. Now, the lineups for next week haven't been announced, and we very well may see Bomber not in the lineup at all. But if he is, you should definitely get him if possible. Although he lost to YoDa in his team's opening game against Prime, he showed perfectly good play to make the game much closer than it should have been, and might have won if it wasn't for his decision to base trade. His tournament results in the last year were a significant improvement over even his WCS 2013 Season 2 win, as he slowly conquered North America on the back of excellent play and his sponsor's tournament series, and he slowly put Bomber's Law to rest for the time being. If he's on the lineup for week 3, there's an excellent chance he can beat just about any player. Additionally, his trade value is about as much as BrAvO, Creator, and Hush. TaeJa is stronger and has the same trade value, but there's a much lower chance he will be fielded. Funny enough, the other player that lost to YoDa. Journey showed potential with cute micro moves, such as sacrificing a reaper to damage marines so that the hellions could kill them, and did his best to stand up to the Prime Terran in a normal, although aggressive, macro game, although he did not manage to actually win. However, as he has displayed promise as a second-string player on Samsung, he is another player to watch out for. His trade value is so low that you can probably get him no matter what sort of team you have. TameNaken quietly earned 22 points this week with his no-trade lineup, which happened to feature 6 players that were all fielded. This includes both winning Ace players Dark and YongHwa, who pretty much nobody else dared try to get. Combined with the solid trio of ByuL, Cure, and TY, who all won, TameNaken advanced over 1000 places to get 32nd place. He is truly a prophet with these picks, as I'm pretty sure nobody legitimately predicted even four of those five players winning this week. Although this should go to Phybe and his -10 weekly score, which was unmatched, I chose to give this dishonor to INFMC. Phybe's team sort of makes sense. Although he was, in retrospect, unwise to choose Bomber and TaeJa, who were both very unreliable and unlikely to both be ever fielded, his dark horse pick of Terminator combined with his Classic/Life combo can hardly be faulted. 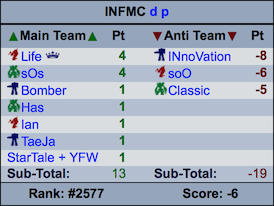 INFMC, however, has pretty much the worst possible team for this week. The first thing you'll probably notice about this team is that he has both Has and Ian on it, as well as two ST players and ST-YFW. Considering the unreliability of ST-YFW with Bomber being potentially MIA and the rest of the lineup being Life, San, and people that probably won't take more than one map in PL, counting on ST winning is probably not the best idea in the world. He also picked Bomber and TaeJa, which is as mentioned risky at best. The anti-team is the worst part, though. Who in their right mind would pick the top three SKT players? This person has the distinct honor of being the only person to have 0 points on their anti-team. To do this, he found one of Flash/Solar/Creator, who were all expensive players, to risk having on his anti-team, and added a couple of miscellaneous people from Prime/KT who will probably never play. Many FPL players came extremely close to sharing this honor, but fell short upon picking someone on MVP or Samsung to make their total player cost 13. There were several anti-teams I considered giving this to, including one that had three players that had won in ace matches (Dark, YongHwa and San, ouch). However, I ended up awarding the "worst anti-team of the week" to DreamerSC, who ended week two in a tie for the most total points lost. 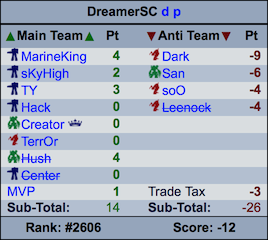 Not only did he lose 13 points from his anti-team, which included the surprise ace San, in the first week, Dreamer decided to trade Leenock, who wasn't playing in week two, for soO, who was, and was punished with a soO win. Dark winning in the ace match and San scoring another point by virtue of being fielded 4th in a crushed team added insult to injury. 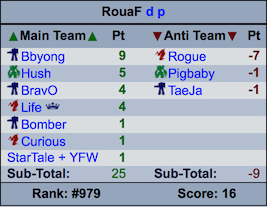 In fact, RouaF enjoyed a very brief period as #1 for one day before following up his stellar predictions of Bbyong, BrAvO, and Hush with almost no points, leading him to fall nearly 300 places before week 1 even ended. Unfortunately, the situation did not improve for him even though his team is perfectly reasonable. Trading would have significantly improved the situation, but perhaps he enjoyed his brief claim to fame too much to notice. ModeratorDespite my username, I am actually a human being. Of that perfect team, I have none of them. Good job me. good stuff. So after 2 weeks I learned to pay more attention to my anti team because I have dark because I didn't recognize the name. not my best move. Yonghwa was a complete disaster for me. I would be #3 if he didn't randomly appear in the ace match and win. Oh well.